February 7th's "odd sundays" features Naomi K. Lewis and Aaron Giovannone. This is a free event that takes place at Corked Wine Bar, 83 Regent St. at 2pm. Come for the reading, the open mic, and the book draw! 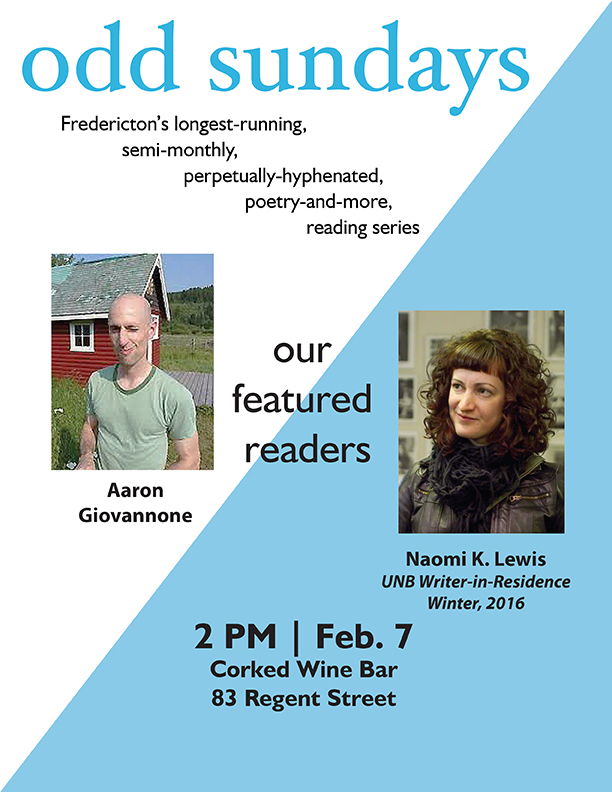 Naomi K. Lewis is the current UNB Writer-in-Residence and is here during the 2016 winter term. She is a writer, editor, and teacher, based in Calgary. Her 2008 novel Cricket in a Fist was written during her time at UNB as a Creative Writing graduate student. Her 2012 story collection I Know Who You Remind Me Of won Enfield & Wizenty's Colophon Prize and was shortlisted for two Alberta book awards. Her non-fiction has been shortlisted for provincial and national magazine awards. For the past decade she has also worked as a magazine editor. Aaron Giovannone’s first full-length collection of poetry is The Loneliness Machine (Insomniac Books, 2013). His poems have also appeared in a variety of literary magazines, including The Antigonish Review, Canadian Literature, Event, Filling Station, Prairie Fire, and Prism International. Originally from St. Catharines, Ontario, Aaron is a graduate of Concordia University in Montreal and the University of Calgary. With a grant from the International Council for Canadian Studies, he spent a year at the Università di Sienaon. He also lived in Castelliri, Italy. Aaron has a Ph.D. in English literature and teaches at Okanagan College in Kelowna, British Columbia.